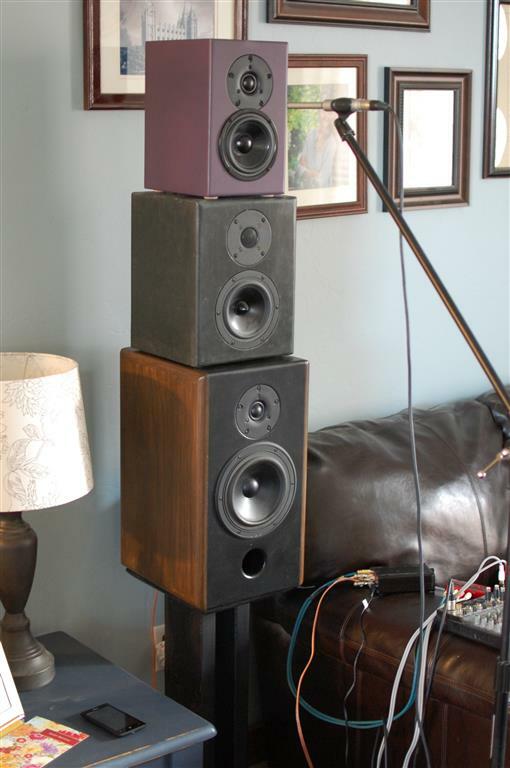 We listen to a lot of music in my family, there are a vast array of speakers and stereos and mp3 players in this house. Whether on the go, in the car, or relaxing at home, there’s always a song playing somewhere. 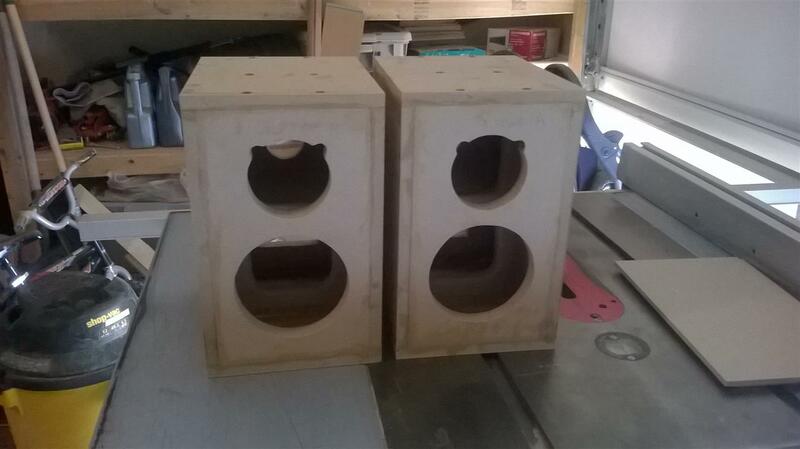 As my oldest daughter’s birthday was approaching, I decided I wanted to build her a small pair of bookshelf speakers for her room. Something that she could enjoy for many years to come. Something that was made by Dad just for her. 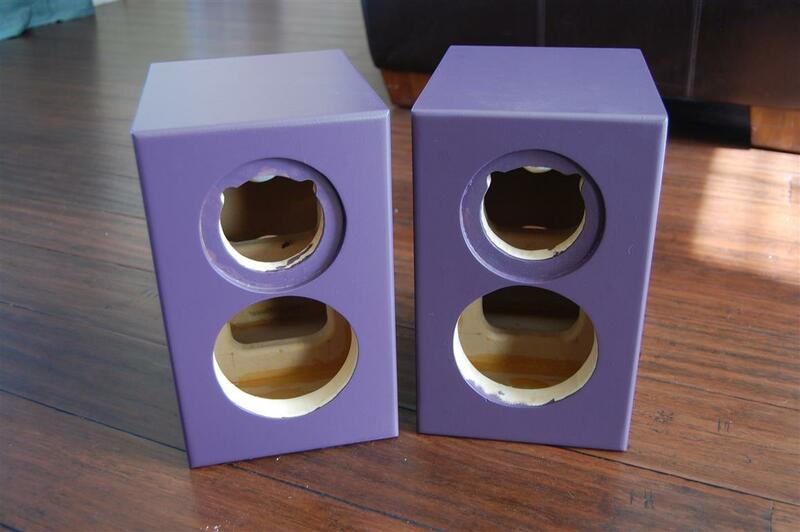 And so I present the “Mini J” two-way bookshelf speaker system. 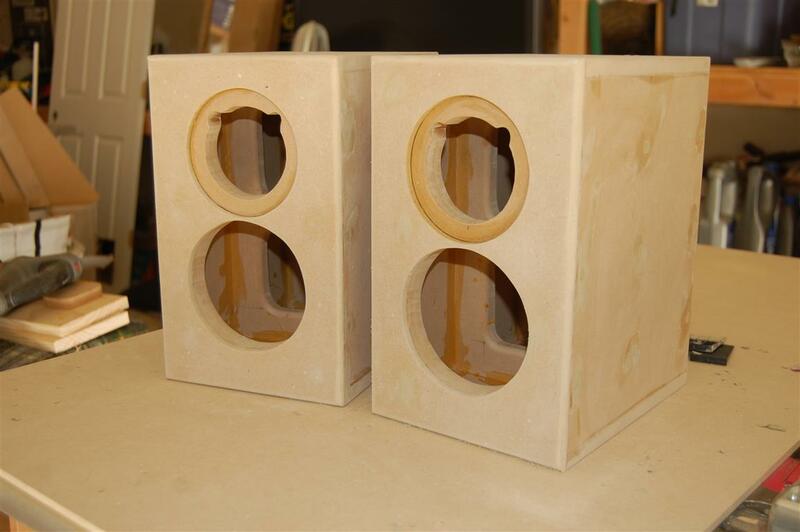 This speaker starts with a Dayton Audio Designer Series 5″ woofer and a 1″ Vifa soft dome tweeter. 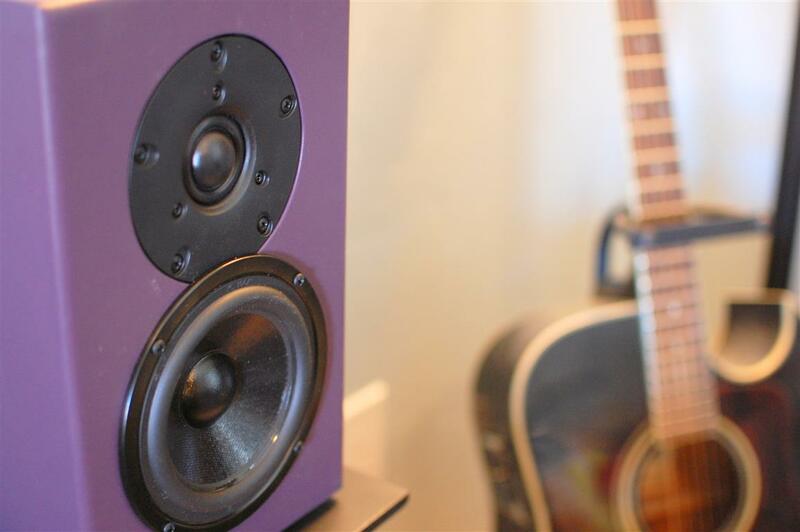 The DS series woofers from PE represent an excellent value, have a great look, and surprising bass response for a driver this small. Decent Xmax and a low fs make this little driver perform very well in a small cabinet size. The great upper frequency extension make crossing over to almost any tweeter a walk in the park. 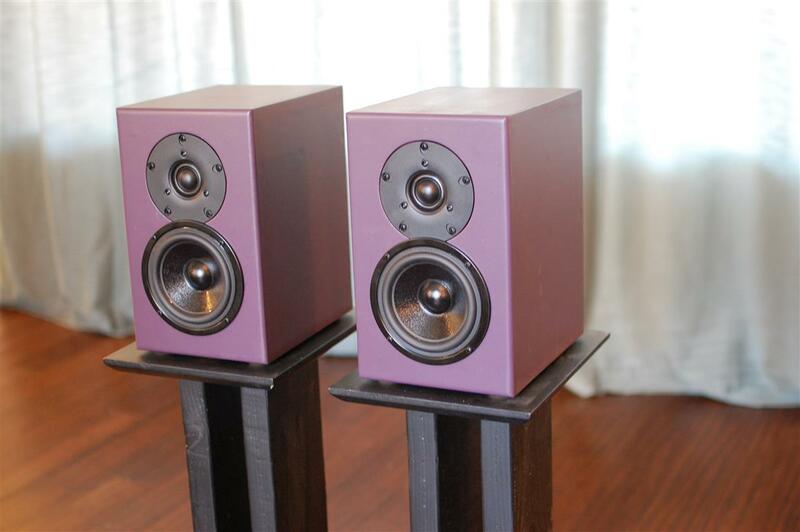 And for the tweeter I picked the Vifa DX25TG59-04 which has great power handling, low fs, and a smooth, flat response out to 20 kHz. It’s got a wide-roll surround around the dome and just has a great overall look to it. Besides, I’m a big fan of Vifa drivers and have been using them for many years. 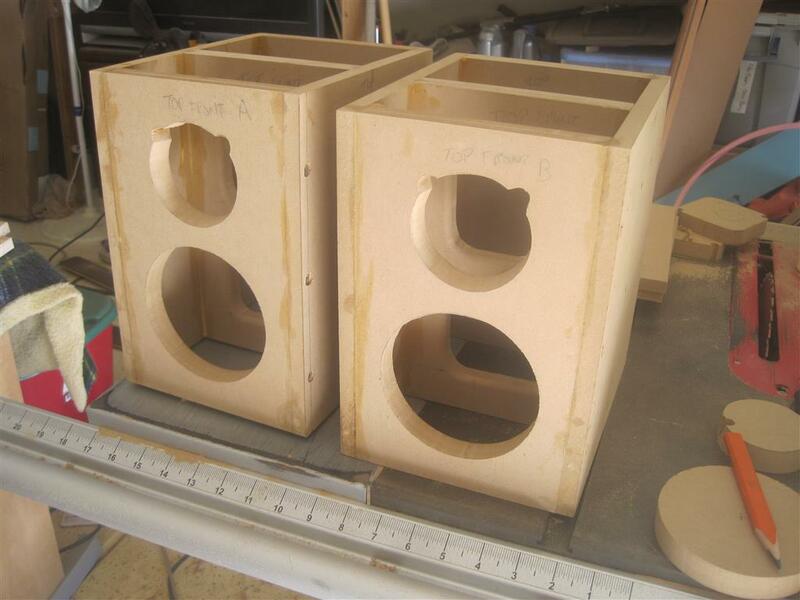 After picking the drivers I started with the cabinet design. 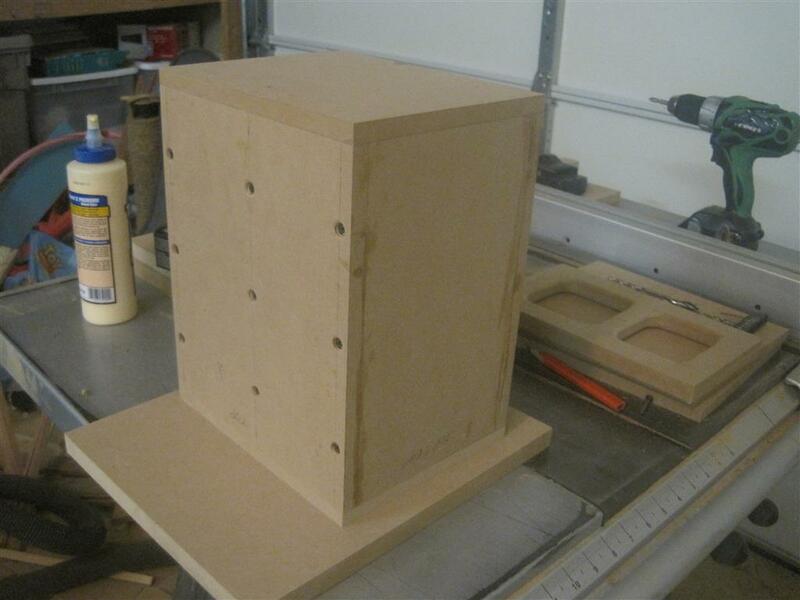 I drew up some initial plans and started tweaking the cabinet volume and shape until I came up with something I really liked. 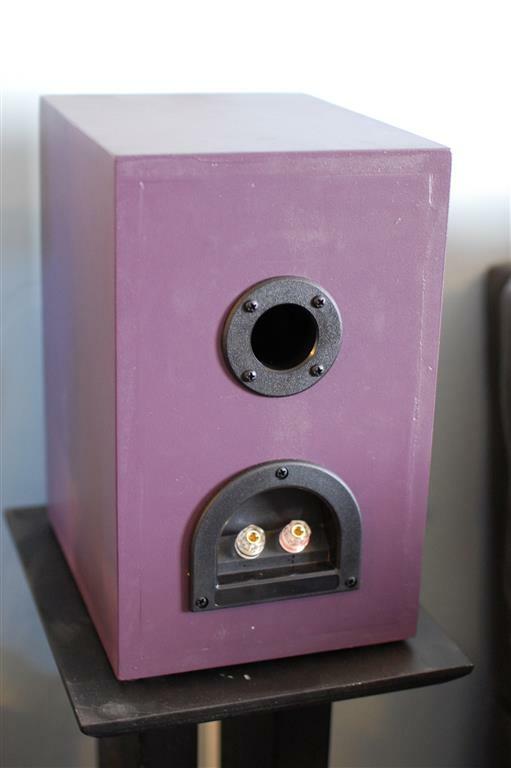 I used Unibox to model the speaker response and ended up going with the Standard Design model which yields an f3 of 59 Hz in a 5.4L cabinet tuned to 56 Hz with no hump or dip in the response. 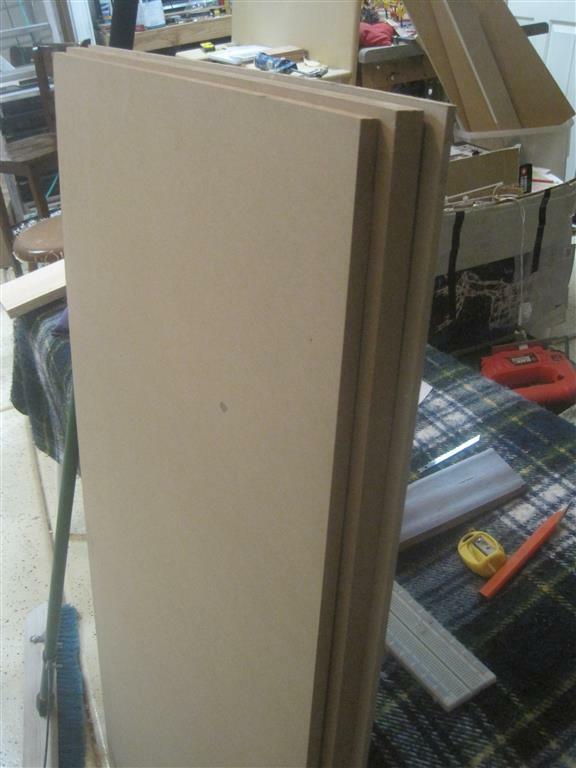 This requires an enclosure size of 11.25x7x9 (HxWxD) using a mixed panel thickness of 1/4″, 1/2″ and 3/4″ MDF. 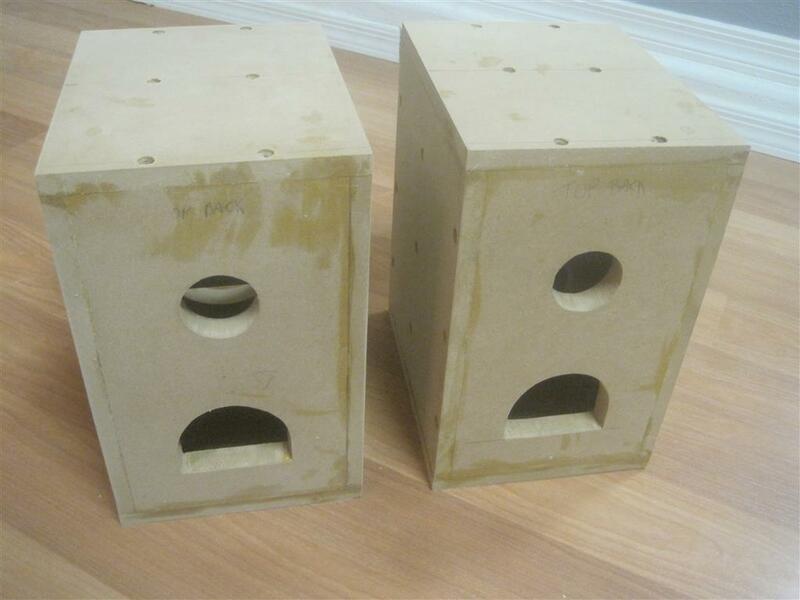 Parts Express had also recommended a similar enclosure volume but they also recommended specific dimensions that meet what’s called the Golden Ratio. 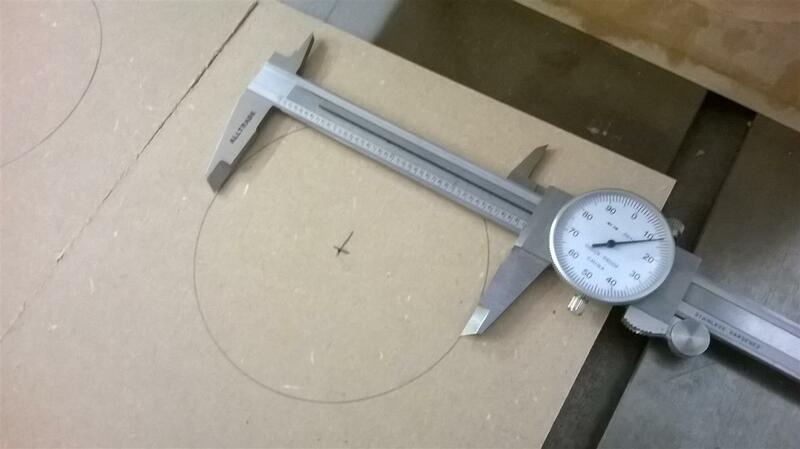 So I gave it a shot and I intentionally made the height and width conform to this Golden Ratio which is 1.618:1. There’s some great reading about the Golden Ratio over on Wikipedia if you’re interesting in killing a few more minutes. Aesthetically the most pleasing rectangular shape to look at and quite possibly exhibits superior sonic properties than other ratios. Hey, but I won’y get into that here. 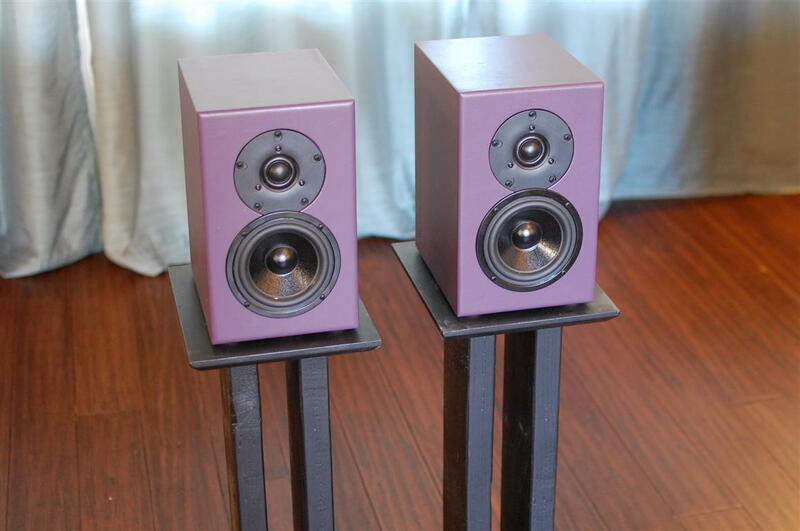 They look great to me and they sound fantastic too, but now I’m getting ahead of myself. 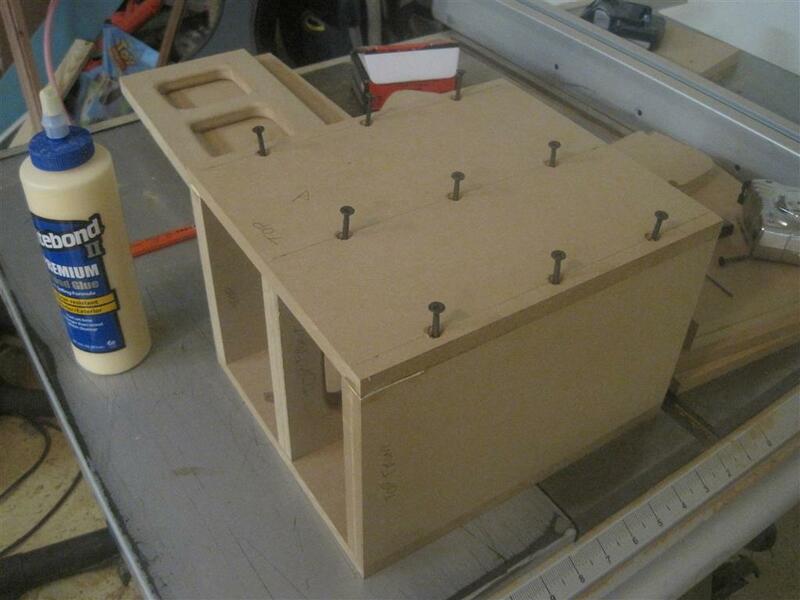 With the cabinet design complete, I moved onto the crossover design. 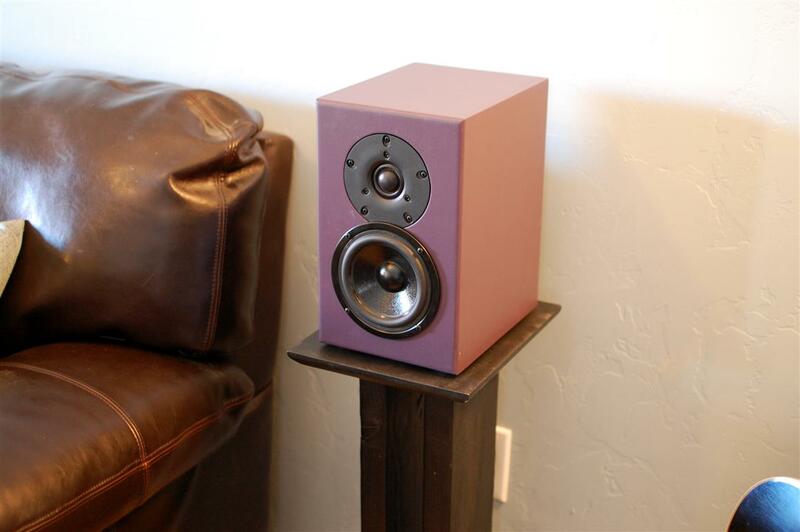 I love the Designer Series drivers from PE because they provide FR and ZMA data for easy import into crossover designing tools such as Passive Crossover Designer. 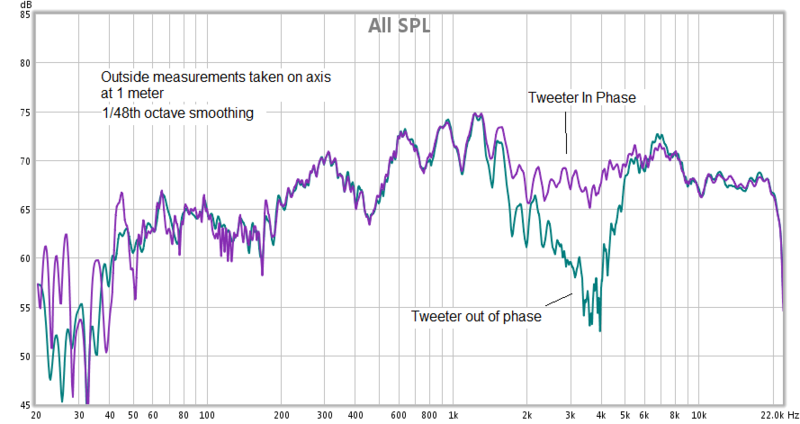 While the Vifa tweeter did not have raw data, I still made good use of SPL Trace to create data from the datasheet by tracing the FR and ZMA plots into data I can actually use. I don’t know why ALL driver manufacturers don’t provide this type of data. 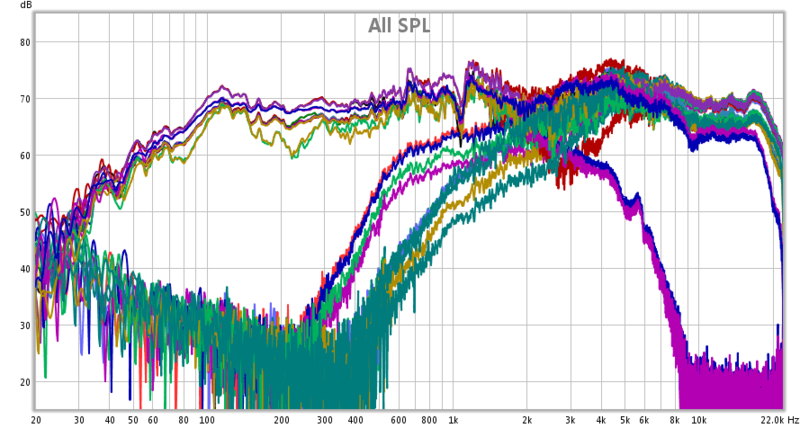 A picture of a plot in a .pdf file is hardly enough for doing any kind of real crossover design. You could argue that the manufacturer raw data isn’t exactly ideal either, but it’s a start. 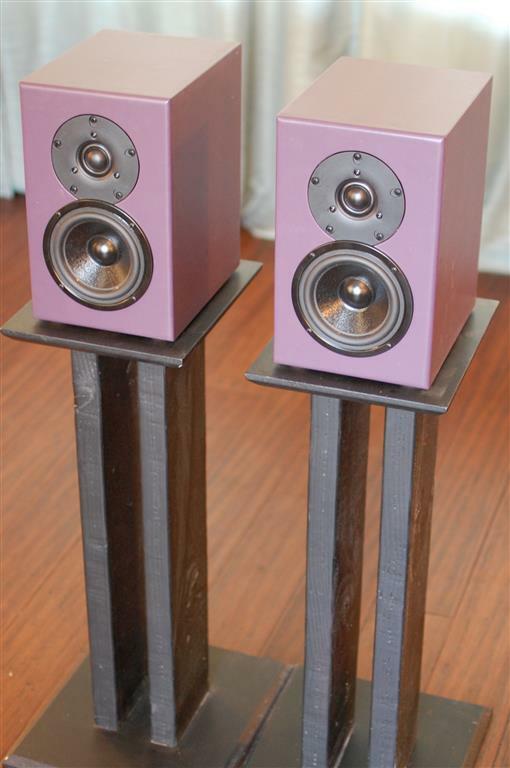 I’ll try and be brief on the crossover design and my methods of doing crossover design because quite frankly it’s just that, my method, and I’m still tweaking and proving my method with each new speaker design. 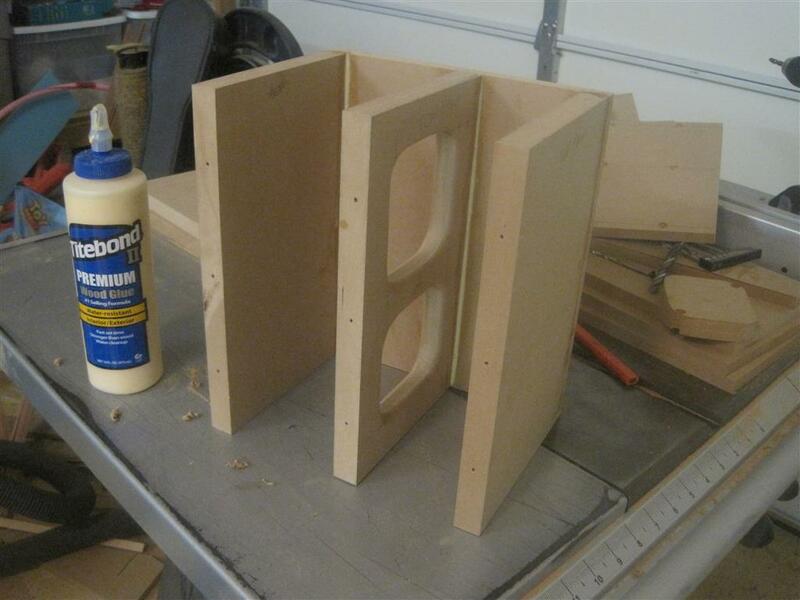 I’m not sure I’m there yet, but this is actually a big part of the fun of speaker building. I always shoot for the simplest crossover with the fewest elements to achieve the flattest FR and a decent impedance. 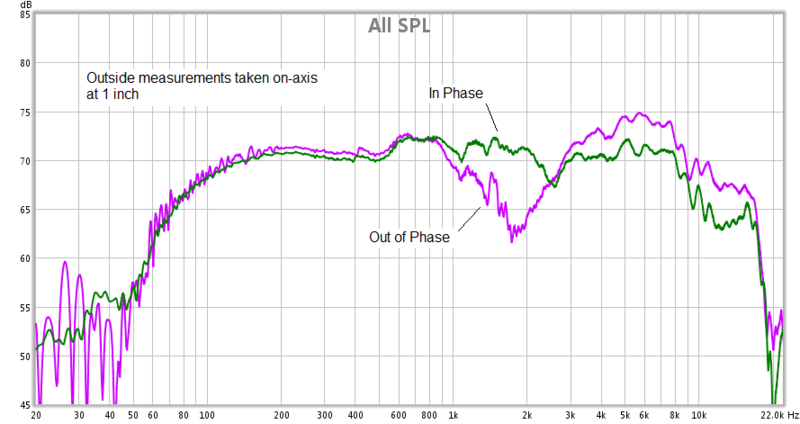 I typically add a Zobel network to the woofer to flatten the impedance above fs which helps with the high-frequency roll-off. 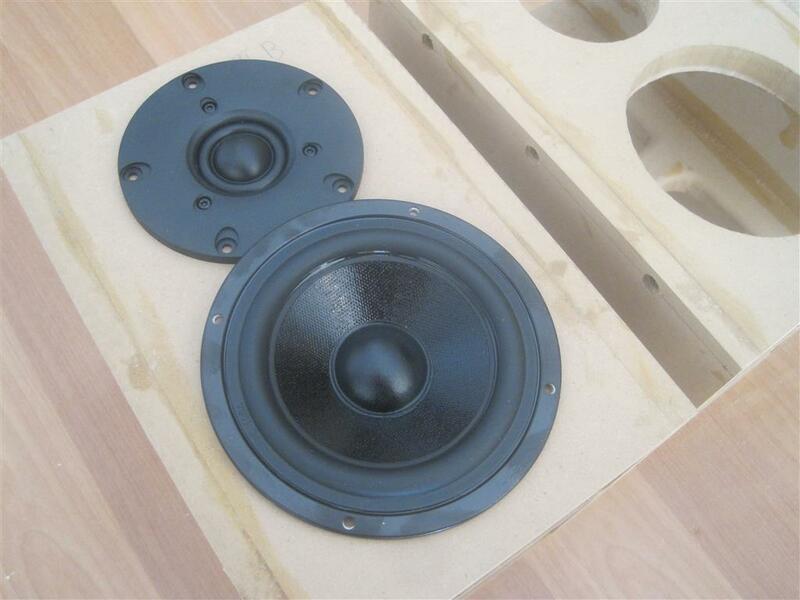 The woofer is a 12dB/octave set at about 2,700 Hz with a cap value that is about double the textbook design value. This provides a sharper roll-off without peaking just before cutoff. 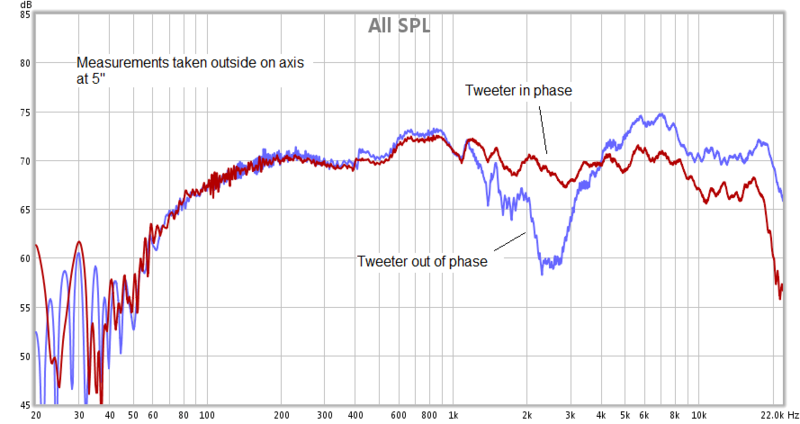 The tweeter also ended up being a 12 dB/octave but wired in phase with the woofer. The inductor in this case is also slightly tweaked to be lower than the textbook value which also increases the slope slightly and according to the simulation blends/sums well with the woofer on-axis. 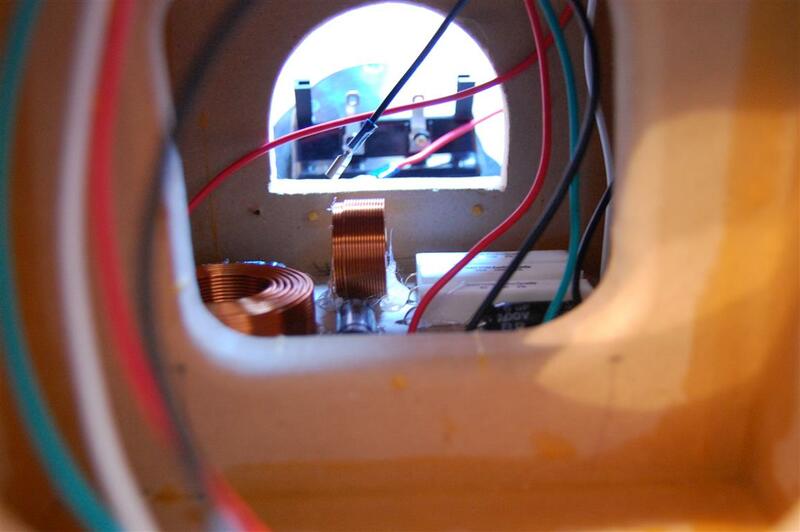 I also added a 4 ohm series resistor and a 20 ohm shunt resistor (aka L-pad) to pad the tweeter and match the overall level of the woofer. It also brings my impedance of the system up to around 8 ohms which is where I wanted it for an easy load to even the cheapest amps. Now that I had some crossover values assigned I started putting parts in my cart at Parts Express. 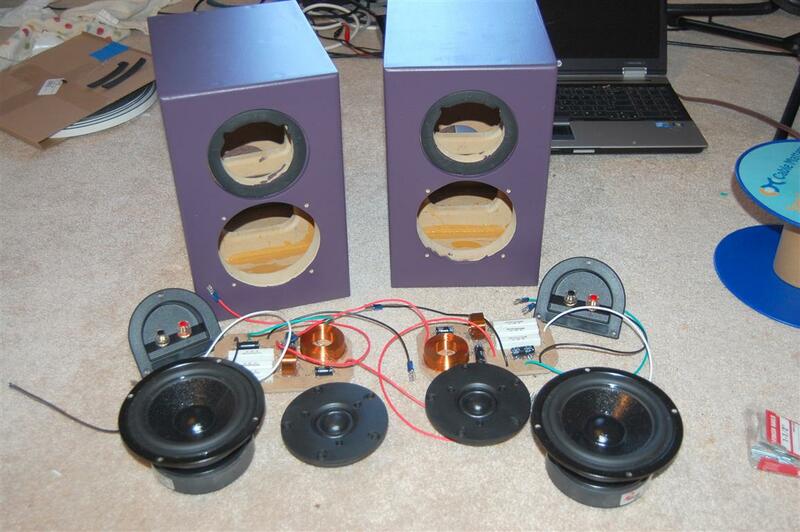 Another fun part about building speakers, getting to buy everything. 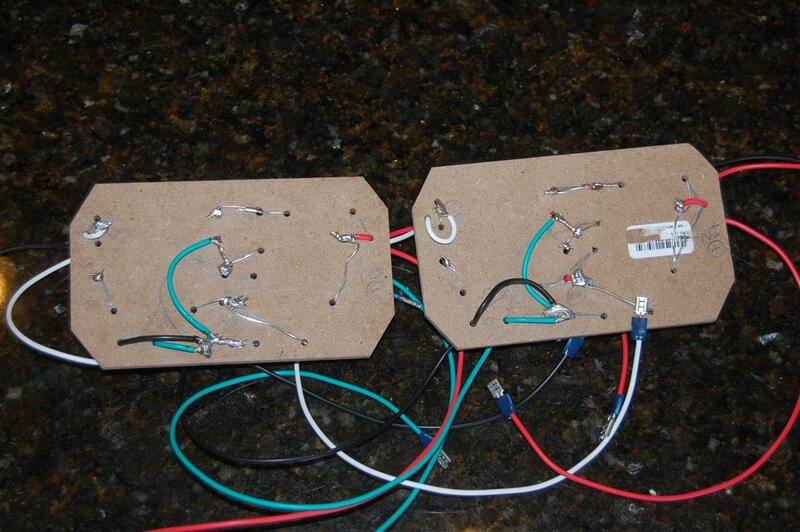 Since the crossover design at this point was just a model, I do like to buy multiple different values of capacitors and resistors so I can tweak things in a listening environment. I didn’t buy a bunch of different value inductors because they are quite expensive and I just hoped that my simulation was close enough to allow me to only tweak the caps once I got closer to being done. 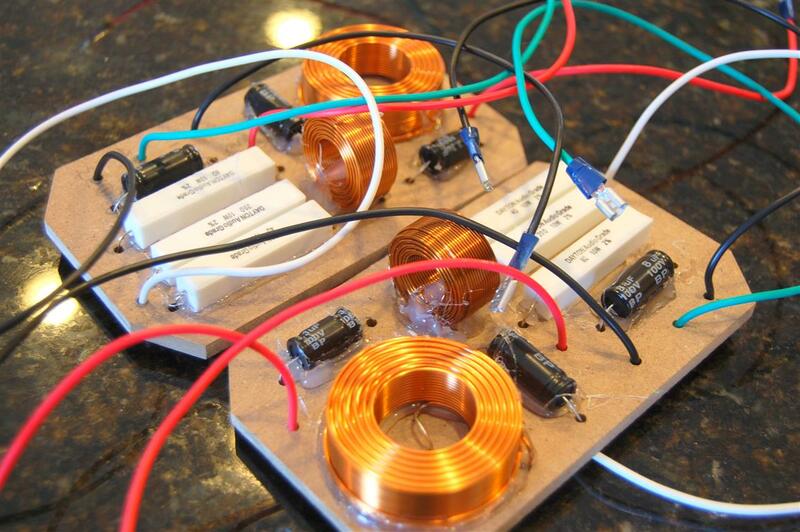 Caps are cheap, especially electrolytics, so I bought every value from 3.3uF all the way up to 15 uF which would allow me several tuning options on both the woofer and the tweeter and the zobel network. 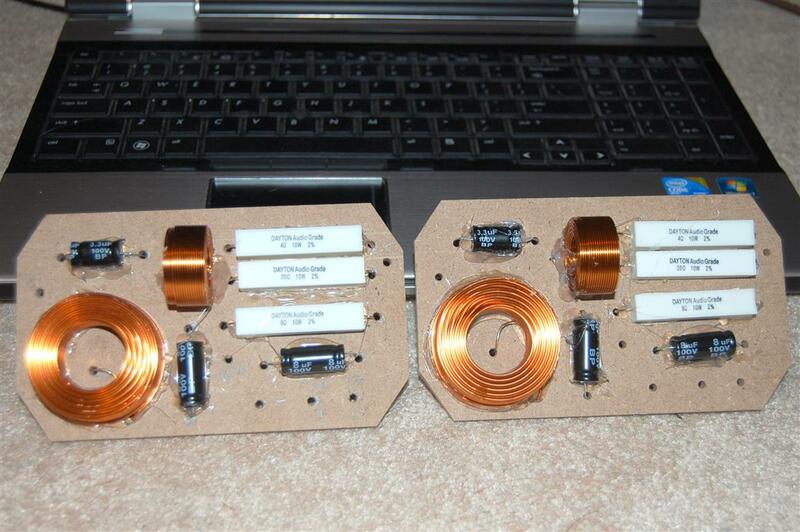 I also bought several values of resistors so I could adjust the tweeter level as needed. 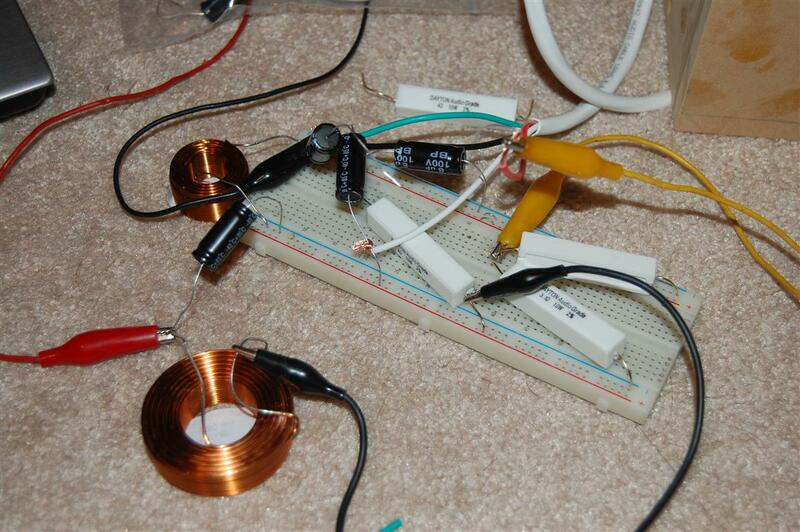 One day I would like to have every standard value inductor/cap/resistor just so I can have the ultimate freedom to tweak but that project will have to wait for another day. 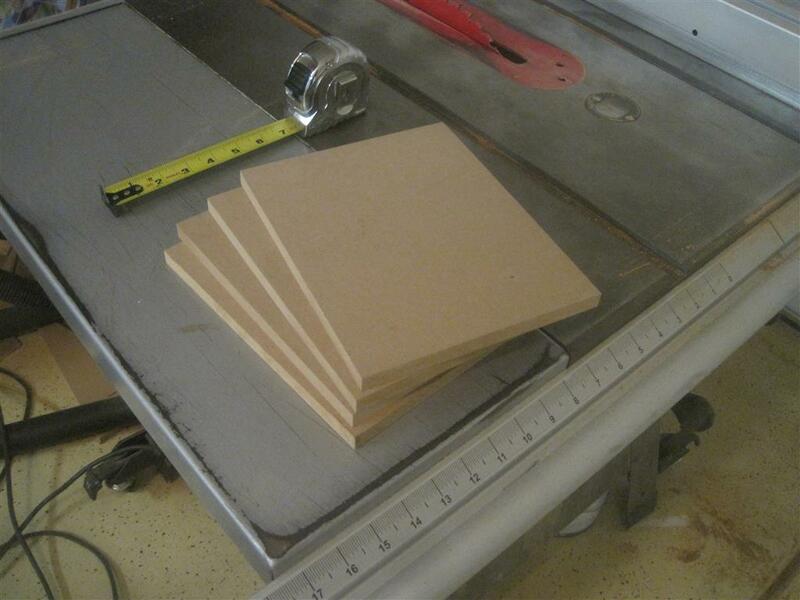 I was just about ready to cut wood at this point, so I drew up a cut sheet and got started. The cutsheet in this case is a little unique. 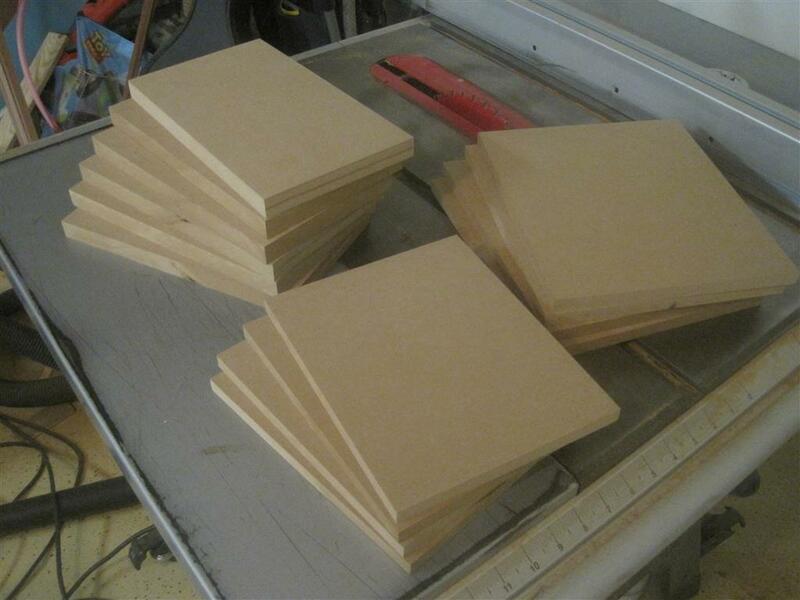 The box design consists of (3) panels of 3/4″ MDF that make up the front, brace and back each piece being 6″x10.25″. 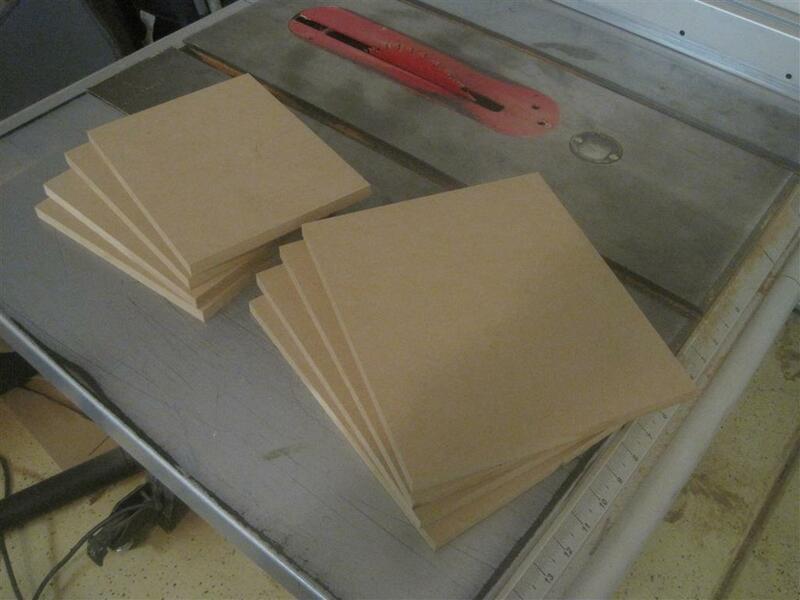 The sides and top and made up of 1/2″ MDF which are cut at 8.75″x10.25″ (sides) and 8.75″x7″ (top/bottom). 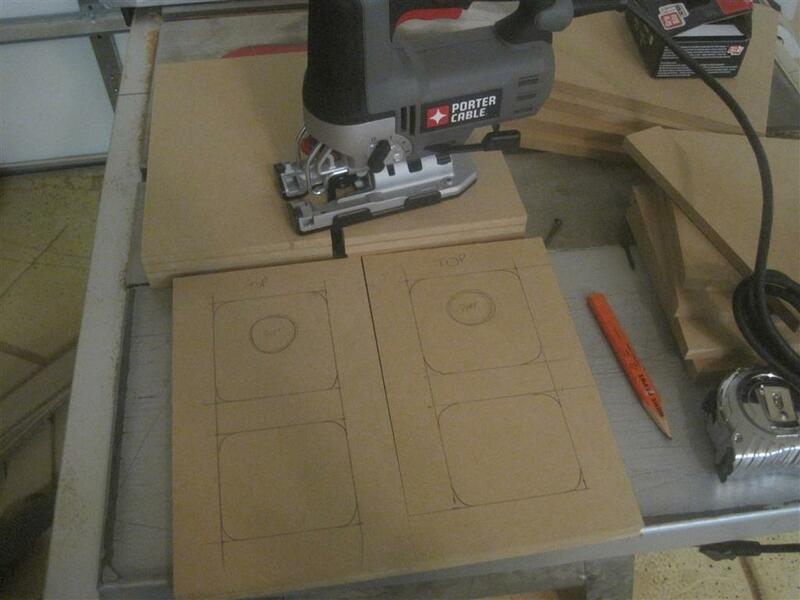 These cuts were a breeze on my table saw and were designed this way so as to allow the table saw to be set to each dimension only once and every cut made so that every cut that is dependent on a flush fit when assembled is exactly the same size, even if the saw isn’t cutting each piece at exactly the width it should. It doesn’t matter because all the pieces that fit together that require that dimension just end up being the same. 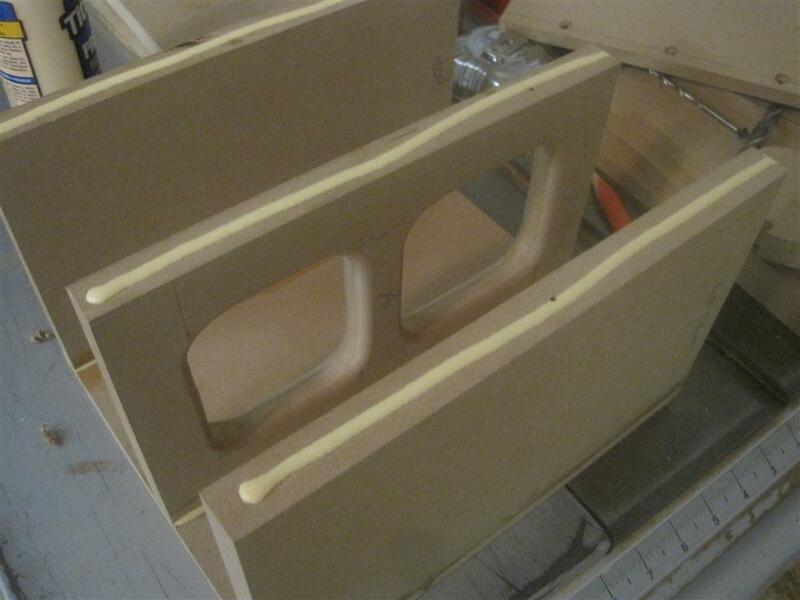 The only cut that matters is the width of the top and bottom pieces which need to be cut to whatever the width of the front/brace/back ended up being +1.0″. 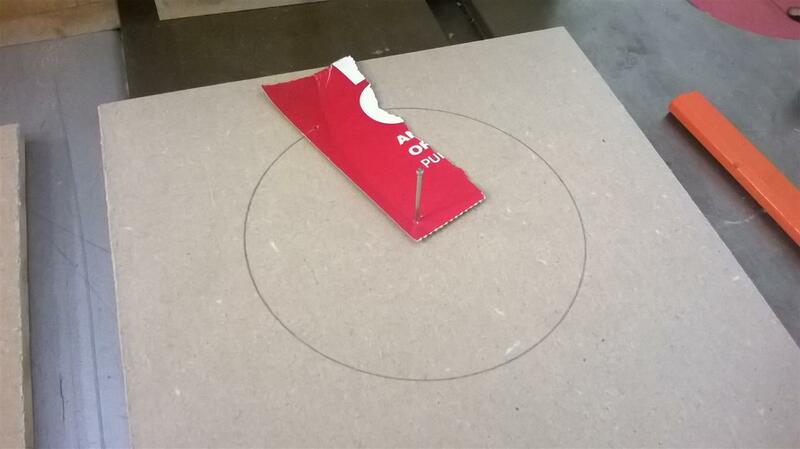 With a table saw, every cut comes out near perfect anyway but even if they didn’t, this design allows for a little slop in each cut while still providing a perfectly flush fit. 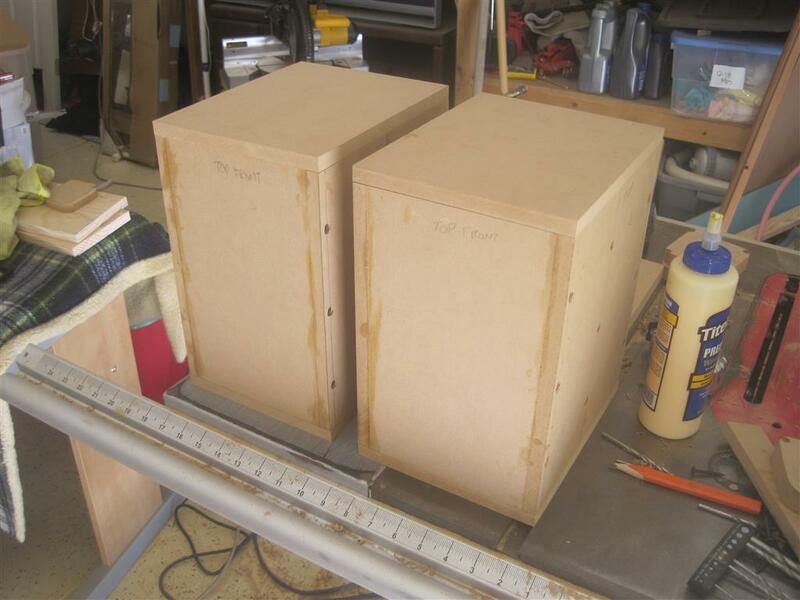 Anyway, I cut the wood, built the boxes, sanded the boxes, painted the boxes, built the crossovers, tweaked the crossovers, measured the responses, installed the drivers, added some polyfill the port and the terminal cup and alas I was finally done. And just in time for my daughter’s birthday the next day. I was able to whip these out in only 4 days mainly just working a few hours each night after the kids had gone to bed. 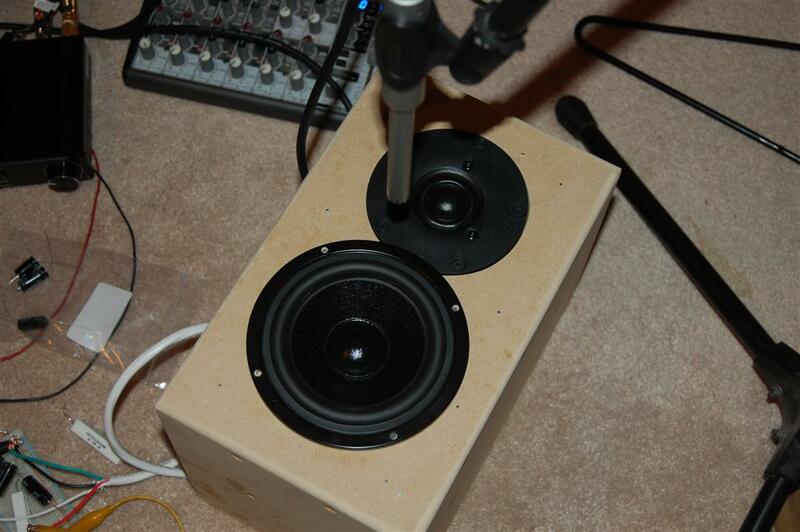 So they are a super easy project but were a lot of fun to design and build and they sound absolutely fantastic. 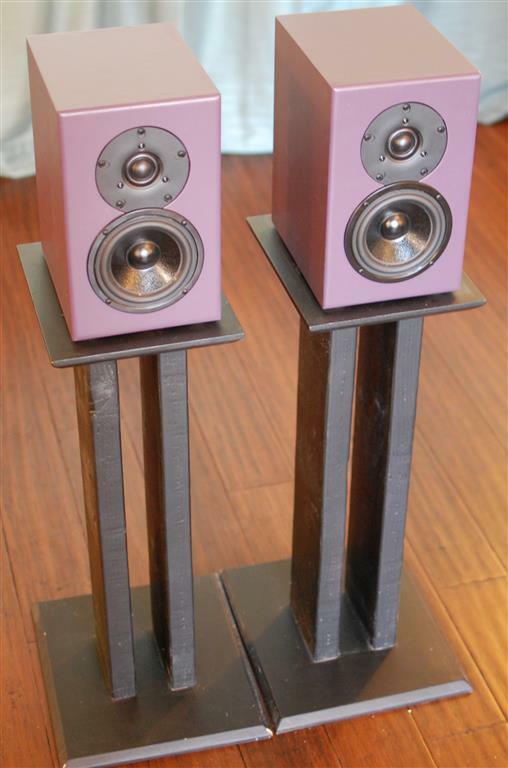 I like the fact that I could tailor the sound a little knowing what type of music will be played on these speakers. 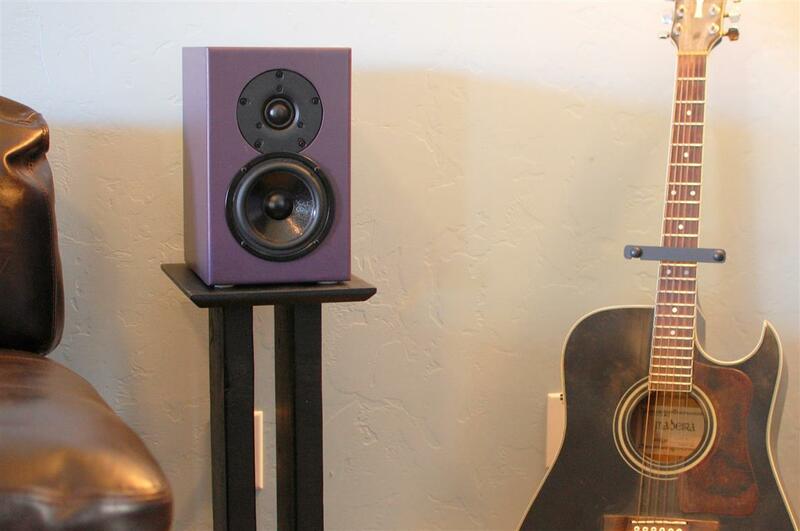 While they don’t have a lot of low-end presence, they make up for it with a smooth, solid-sounding midrange and treble. 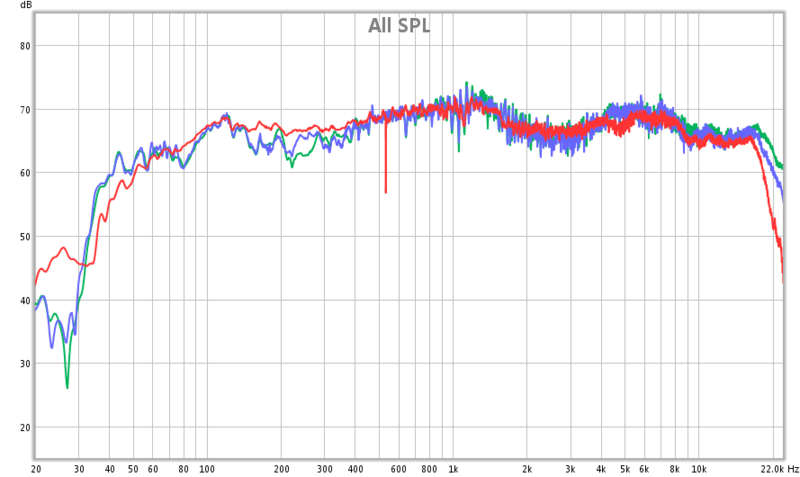 I’m not all about that bass (no treble) and can appreciate a speaker’s ability to produce vocals without coloration. 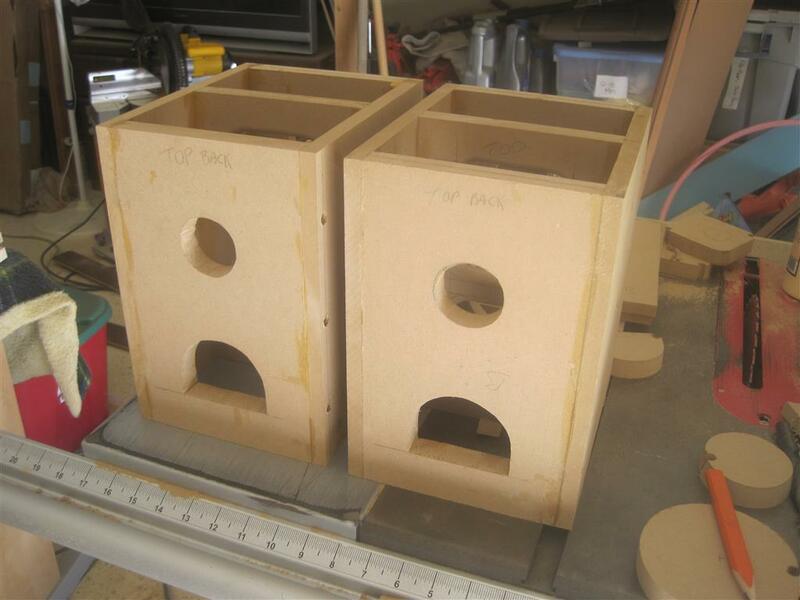 The boxes are rock solid too, very little resonances despite the 1/2″ MDF. But enough fluff, here’s the meat and potatoes. Click here for a parts list from Parts Express. 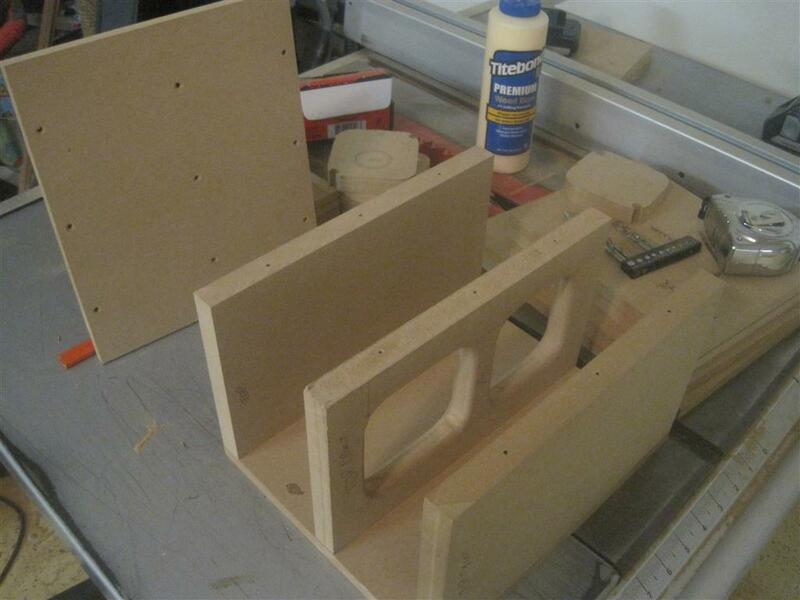 Check out some of the build pics below as well as pics of the final product. Hope you enjoy! Finally, scroll past the pictures for in-room measurements and near-field plots of various crossover options and L-pad values I had considered. In the end, I chose what “sounded best” to me regardless of what the plots actually looked like. 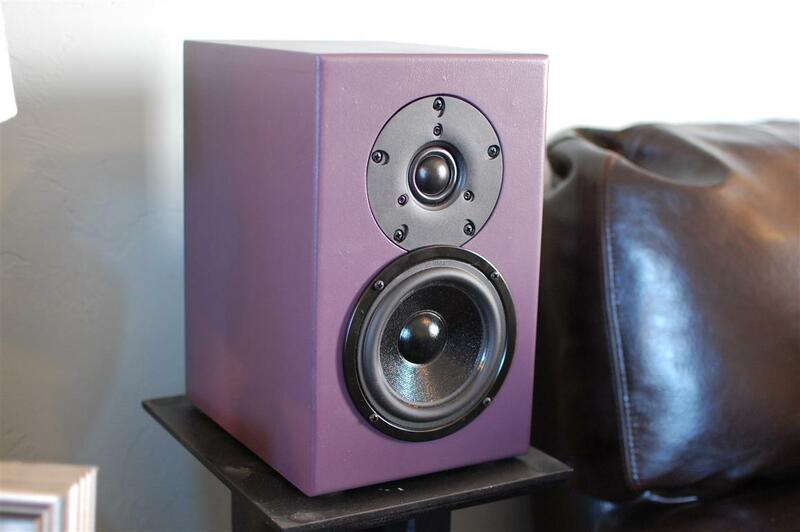 So with most speaker projects just getting that first listen is an awesome feeling. 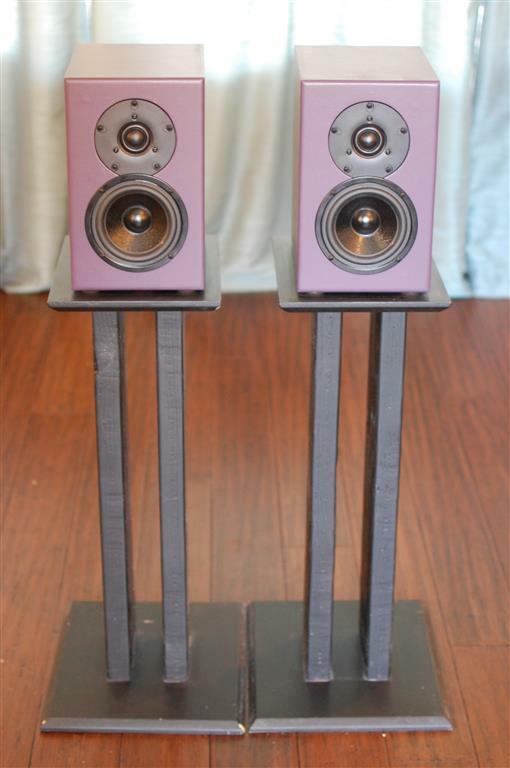 These speakers definitely sound great. 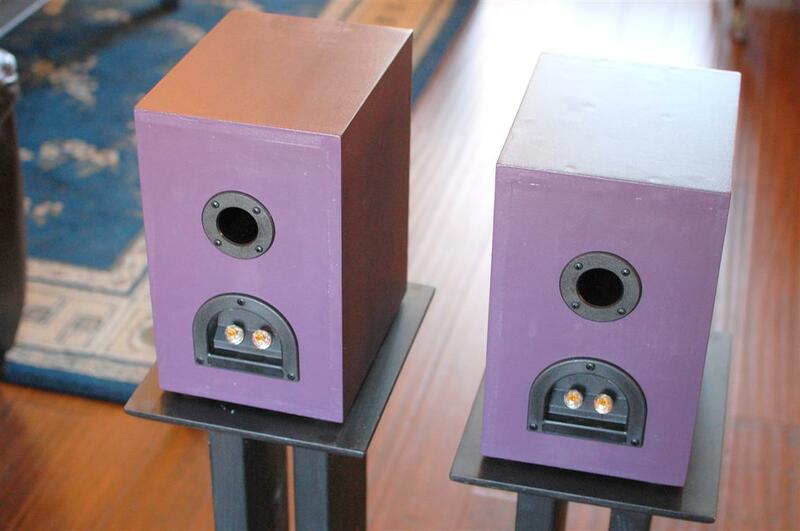 Good balance between the woofer and the tweeter and they have a really good soundstage, so music doesn’t sound like it’s just coming straight out of these two drivers. You close your eyes and listen and you can’t really tell where the speakers are located. The music just fills the room in front and behind. And I love that. No harshness out of the tweeter either. You can put your ear right up to it and it sounds clean and smooth. 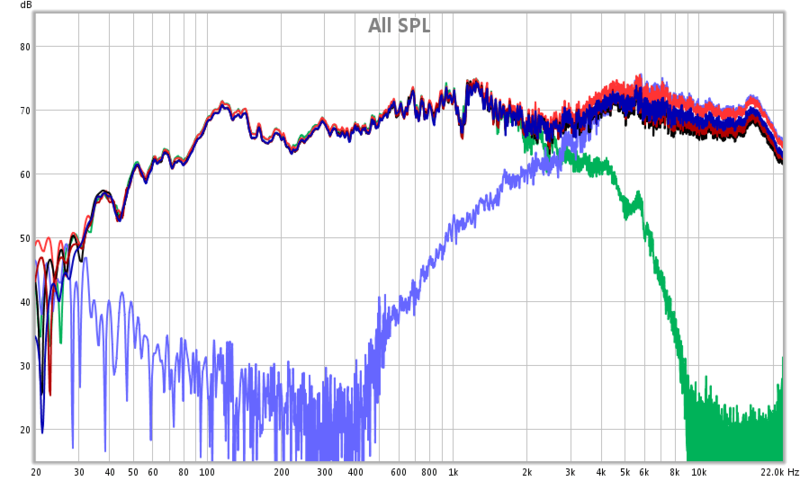 So here’s some FR plots. 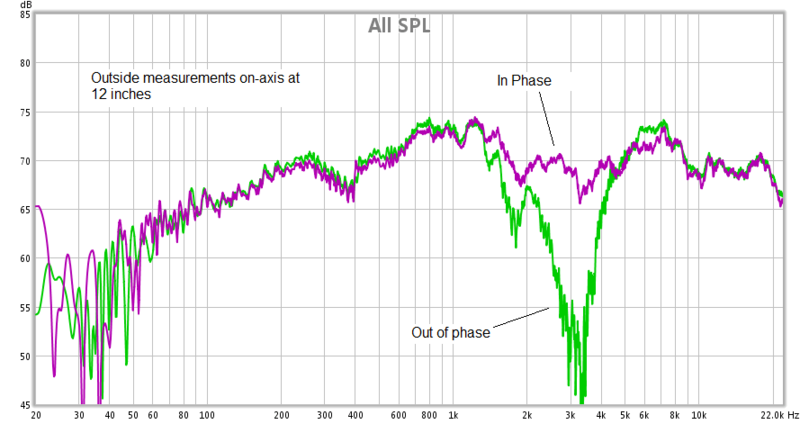 I don’t try and read too much into every little bump and valley, I’m mainly looking for an overall balanced sound. 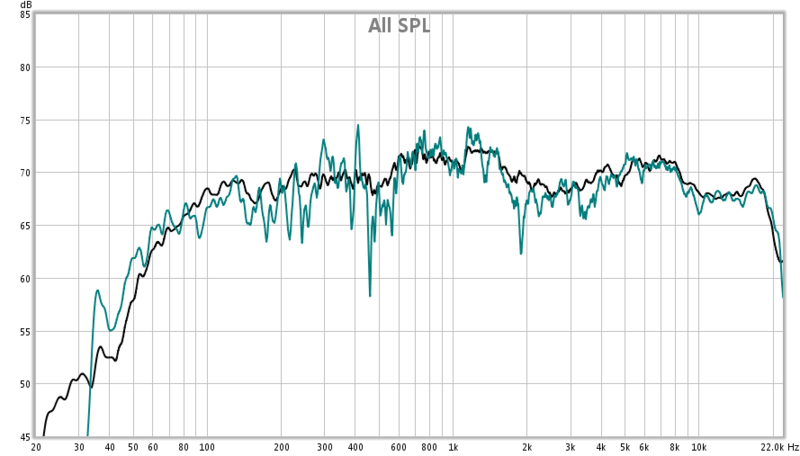 The slight dip near the crossover freq is mainly due to the close proximity of the microphone in between the drivers which actually shows up in the PCD model as you move the listening position closer to the speaker. I suppose if I had a little more time and a few extra cap/inductor values on-hand I may have tried achieving a slightly flatter response, as I am sure it is achievable, but for now I’m going to call it good enough and overall I am happy with the results. 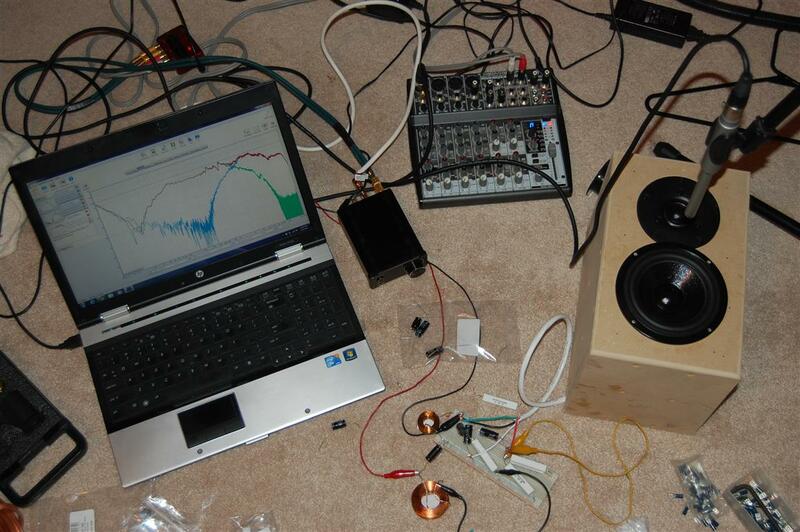 The last thing I did was take my measurement gear outside and ran some FR plots in basically a near-anechoic environment. 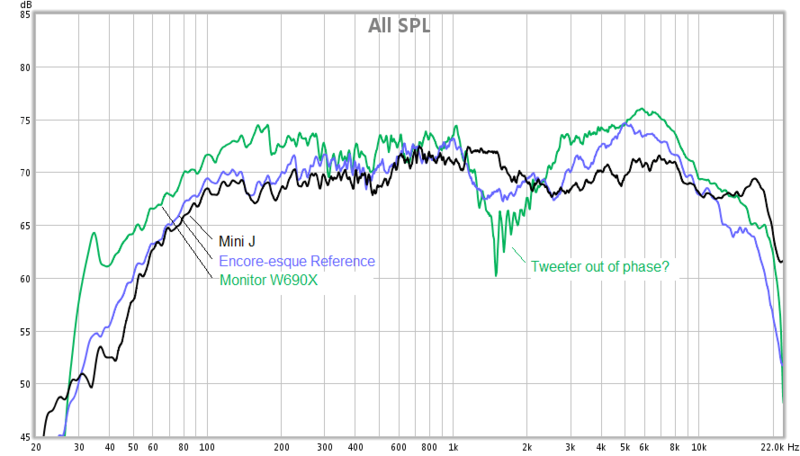 I took a bunch of measurements at several different distances with both the tweeter wired in-phase and wired out of phase (meaning + to + and – to – on both woofer and tweeter) therefore actually making the speakers acoustically out of phase due to the 12 dB/crossover yet quite possibly back in phase due to the delta in physical relationship between the acoustic centers of the woofer and the tweeter. Confused yet? These plots at least tell me that everything is summing properly on-axis which yields the flattest FR. 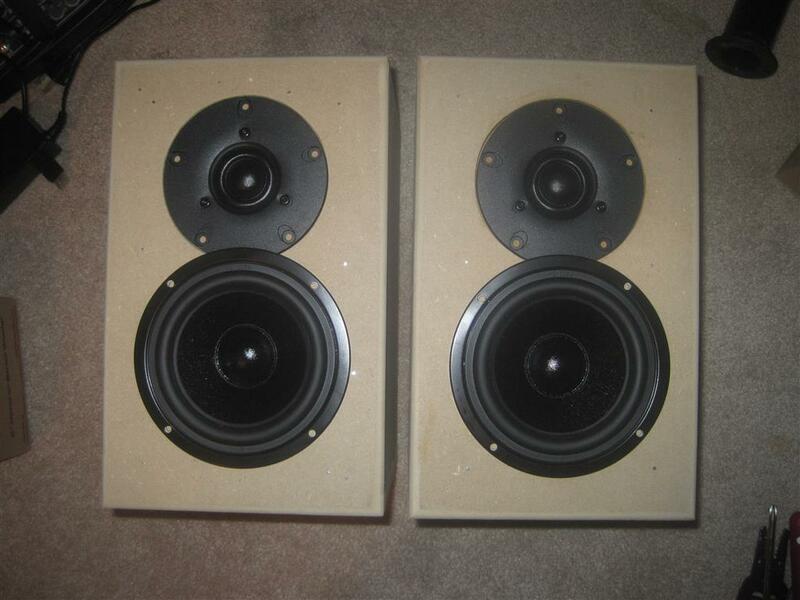 Notice that these speakers do not have baffle step compensation as is evidenced in the plots below. 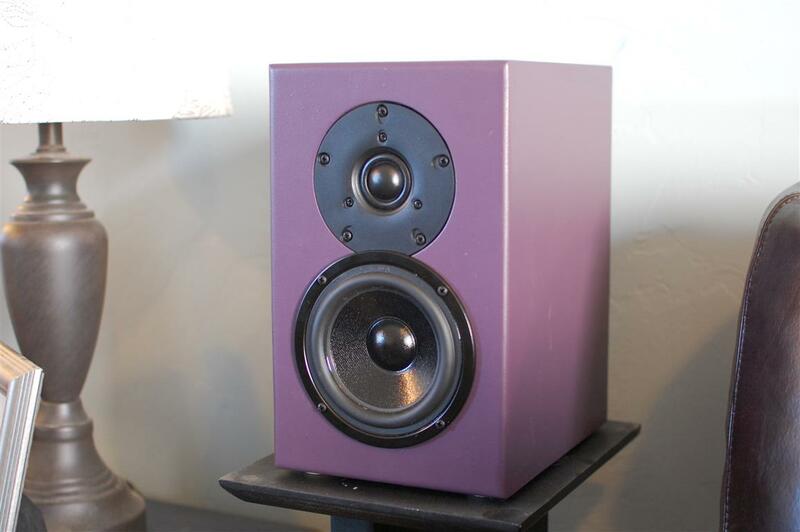 I decided not to incorporate it since these speakers will almost always be backed against a wall in a very small space, I didn’t want the bass and lower-midrange region to be too aggressive. 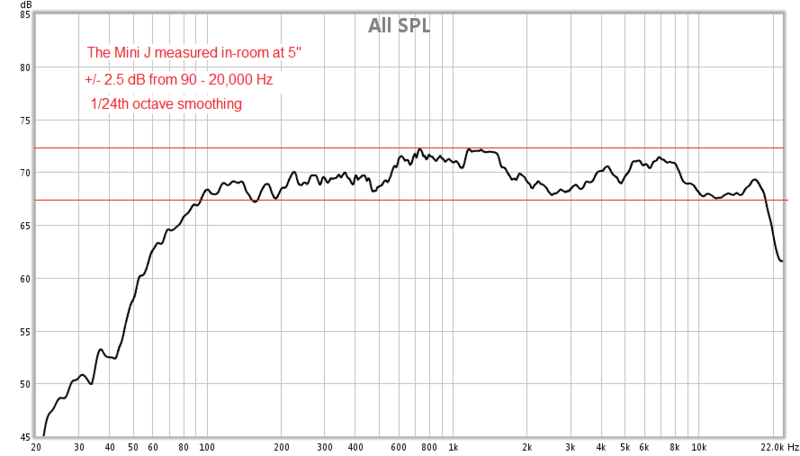 You can see from all the measurements, in-room included, that there is a definite rise in amplitude between 500-700 Hz. 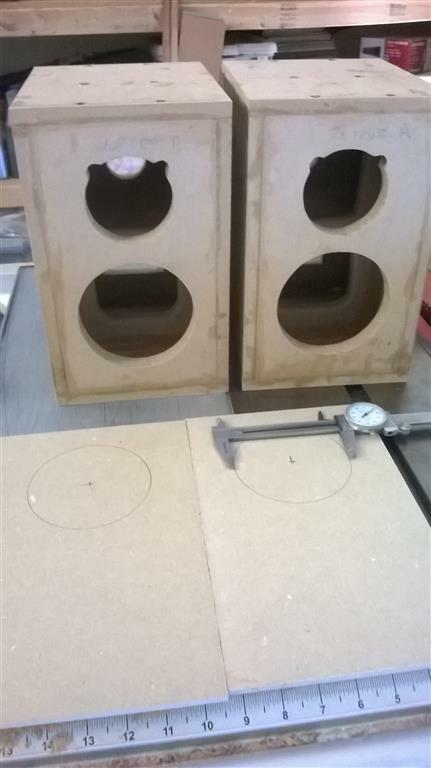 John Murphy of True Audio came up with a quick formula for approximating the -3 dB point given the baffle diameter (or width) which is f3 = 380/W where W is the width of the baffle in feet. 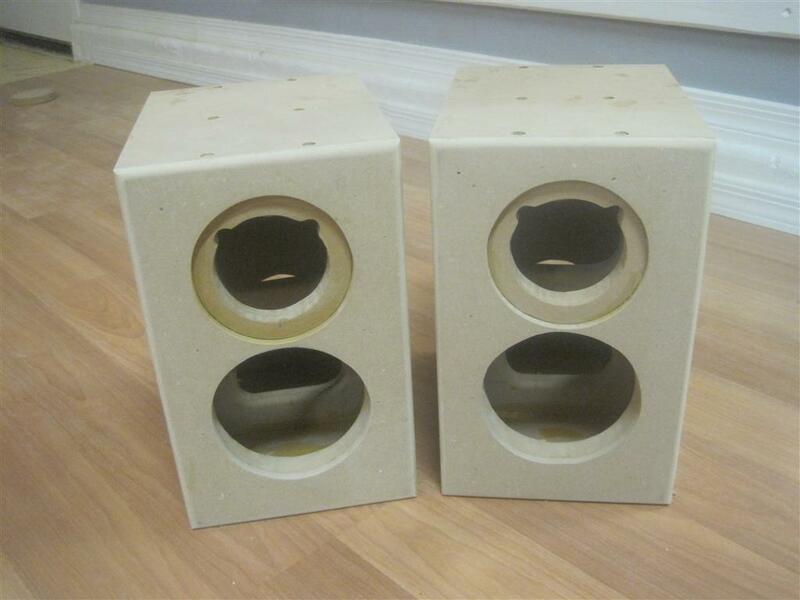 These speakers are 7″ wide, or 0.588 feet which amounts to a -3 dB frequency equal to 655 Hz. That matches well with the measured data shown here. 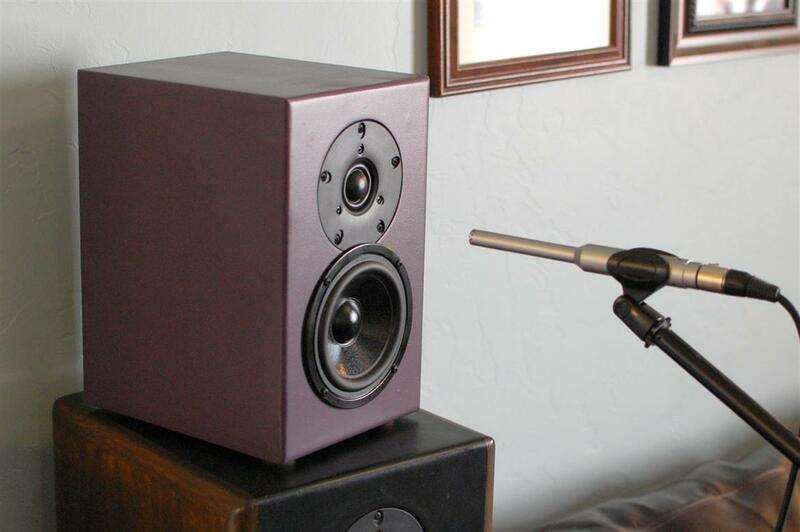 Even without BSC, the speakers sound fantastic in-room, but if I were to implement it, I wouldn’t do more than 3 dB and I would shoot for a corner of about 655 Hz. 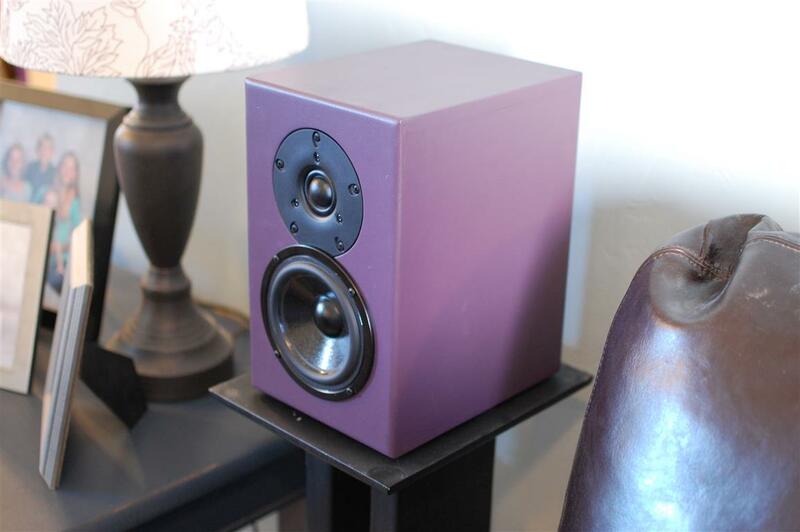 This entry was posted in Audio/Video and tagged bookshelf, crossover, dayton audio, design, designer series, DIY, DS135-8, dx25T, Music, purple, REW, sounds, speaker, tweeter, vifa, woofer. Bookmark the permalink. Nice creativity Dan ! 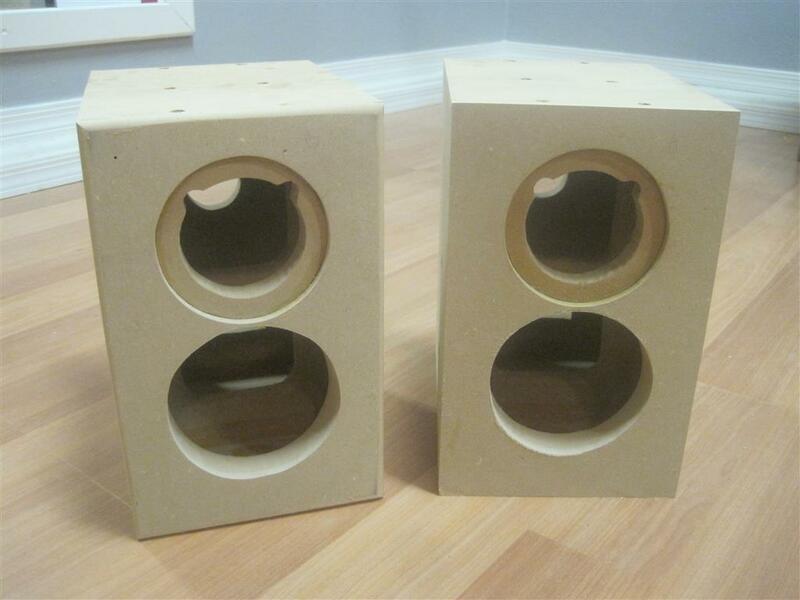 Thanks for sharing this one of the best & easy Bookshelf Speakers DIY. It is in of my sunday to-do list for students. Window bracing cut Size ?x? 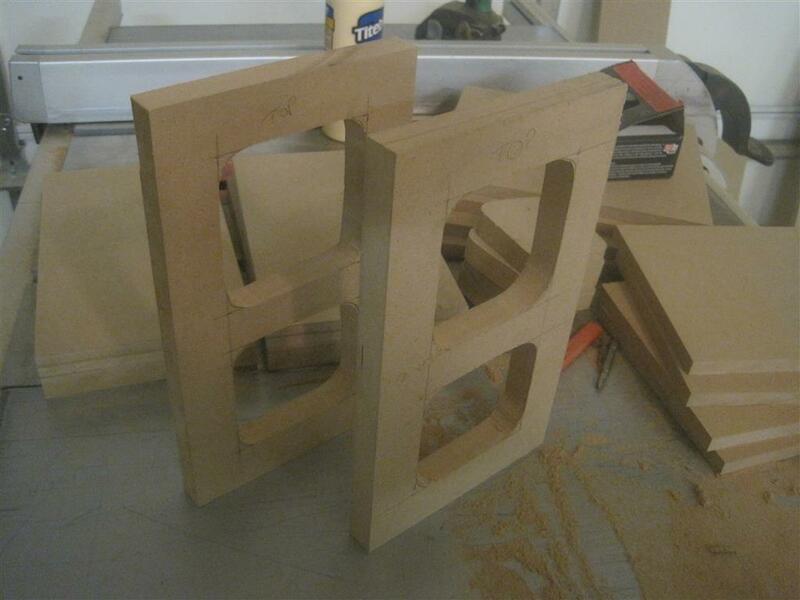 Window bracing is 6×10.25. The bracing is meant to be the same size as the front and the back pieces for simplicity and ease. 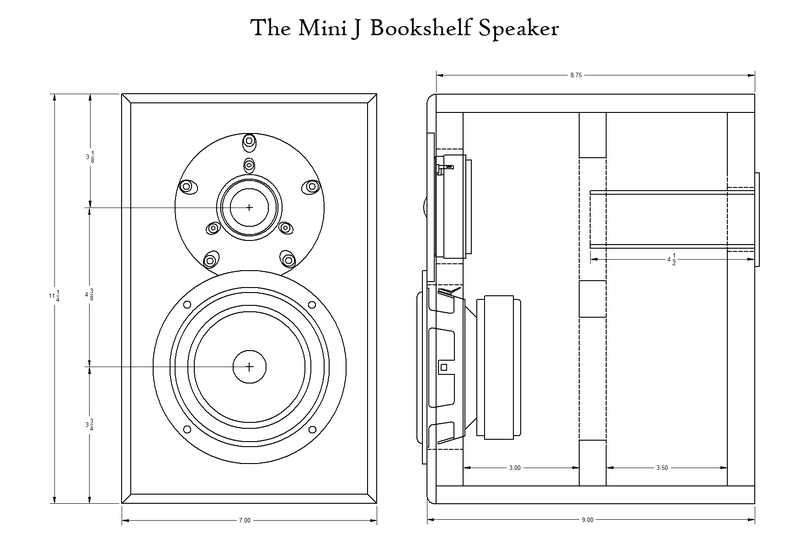 This looks like a decent little bookshelf design for me to have a go at. Much thanks for the very comprehensive description and pictures. I’m tempted to want to try top- quality film caps in the x-over. 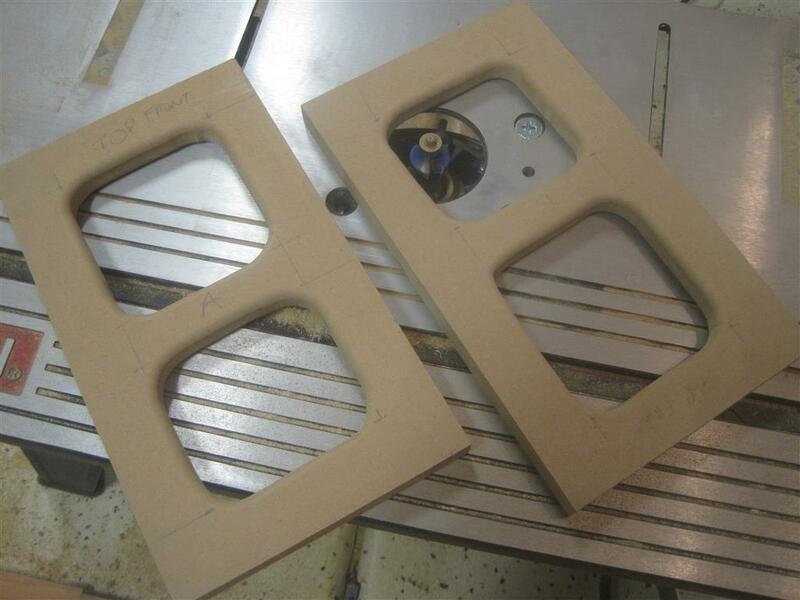 From what I can see, the design could benefit from better quality components. Just a thought. I’ve looked at the suggested x-over software, but in common with all others I looked at, none are suitable for Mac. This isn’t necessarily an issue because I’m confident that you know far more than I about x-over design, but the ability to learn how to use x-over software and possibly tweak the design to suit my domestic needs would be nice. Is there any flexibility using different drivers? There are some that I quite like. I suppose that provided the Theil/Small parameters are similar there wouldn’t be too much issue. 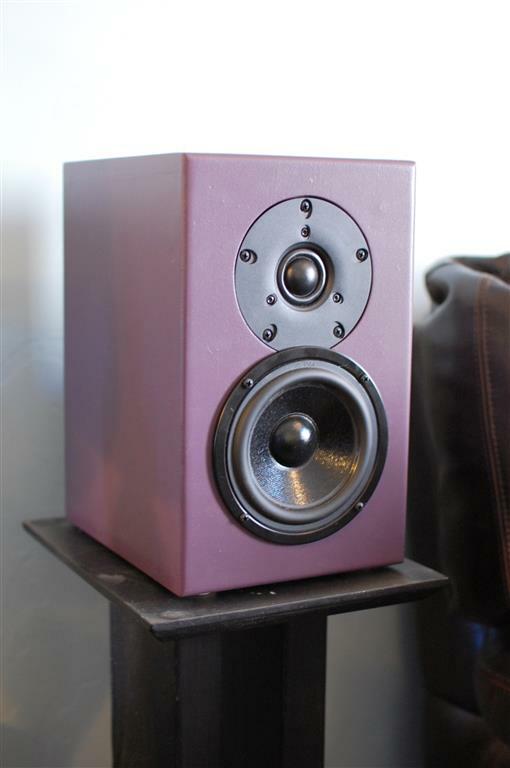 My goal is bookshelf speakers that will be aurally excellent and remain so for many years (not at any cost cos I’m a pensioner, but I’m prepared to spend $$ for something ‘right’). May I contact you on occasion if I have any queries? 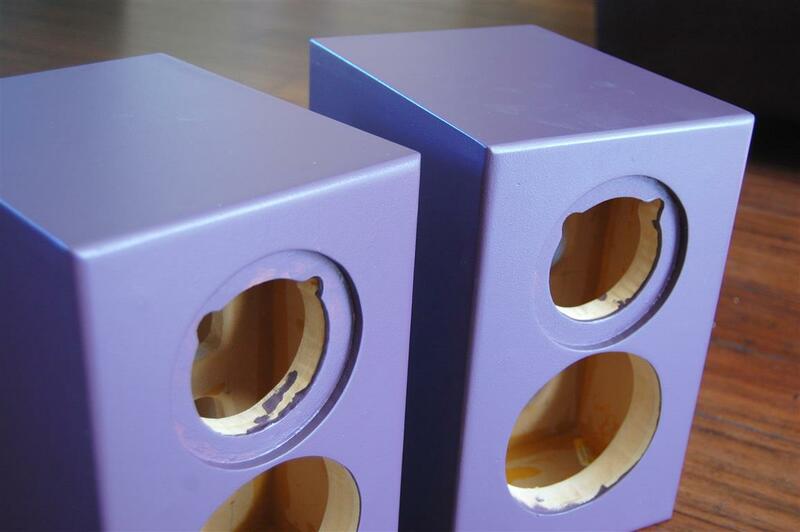 The port diameter is 1-3/8″. 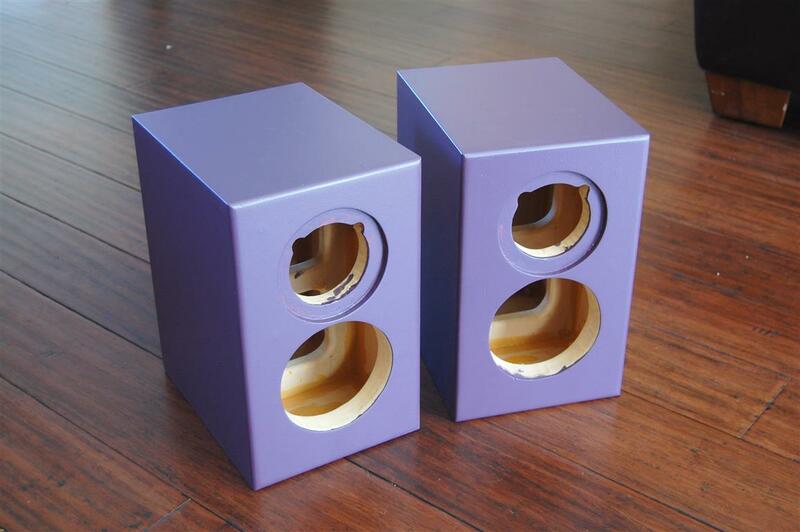 Here’s a link to the port from PE – https://www.parts-express.com/parts-express-speaker-cabinet-port-tube-1-3-8-id-adjustable–260-388. You’re right, I forgot to show that in the drawing. And buried within this post is a link to all the parts where it shows the port diameter. But that’s the only place. Thanks for the comment! Great, one more question. 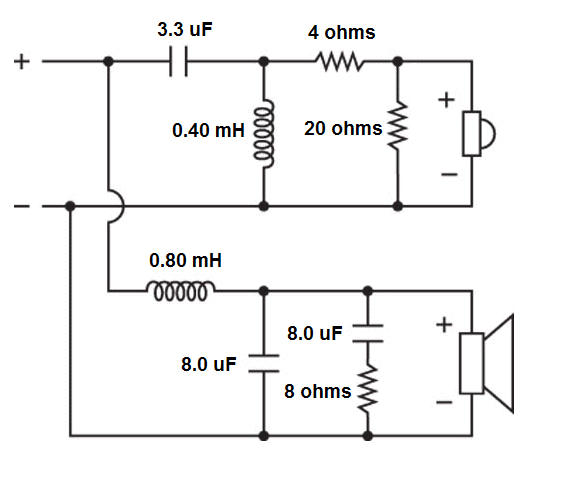 5,4l internal volume is without driver and port right? I draw up you build in 3d and cant get it t0 5,4, more like 6? 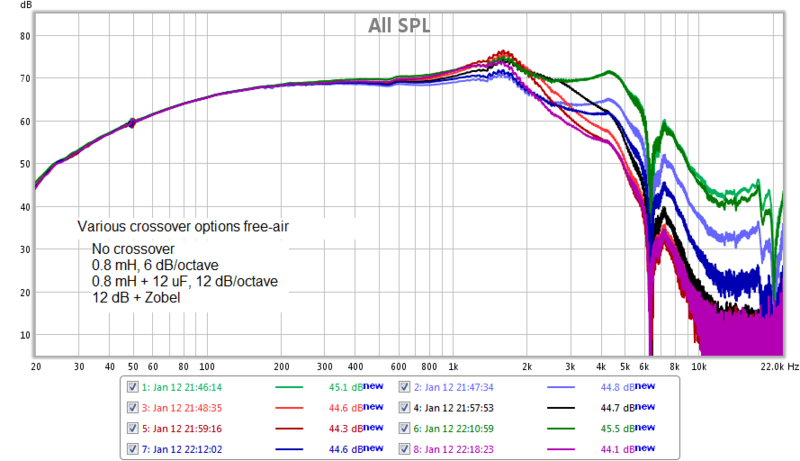 Yes, net internal volume should come out to about 5.4l minus driver, port and internal brace.